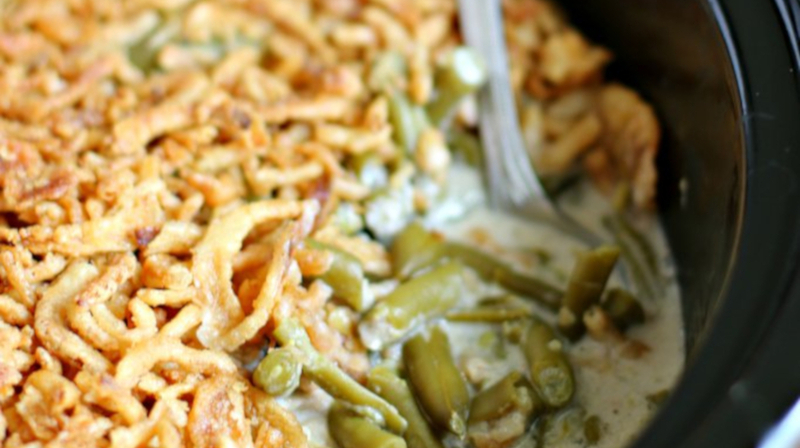 You can’t have Thanksgiving without green bean casserole, but if you want to do green bean casserole in true Thanksgiving style, you can’t use frozen green beans or jarred alfredo sauce (yuck!). For the sixth day of our 10 days of Thanksgiving we have featured this delicious slow cooker green bean casserole because lets face it, Thanksgiving cooking can be stressful enough and this slow cooker recipe allows you time to do some other much needed things while still being able to enjoy a delicious family feast! In a very large bowl, add the cream of mushrooms soup, Arps Dairy Milk, black pepper, and onion powder, whisk until smooth. Add the drained green beans, and 1 of the canisters of french fried onions into the large bowl with the soup mixture you just made, and with a spatula, fold everything together, being careful not to break the green beans up. Spray the slow cooker with the non-stick cooking spray, and add the green bean mixture to the slow cooker. After cooking time is done, add the other canister of french fried onions onto the green beans. Take the slow cooker insert out of the heating element, and put into the oven (without the lid on!). My oven was set at 350 degrees. Cook for about 10 minutes, or until the onions are browned. Set the insert back into the slow cooker heating elelment, replace the lid, and set the slow cooker to WARM until ready to serve. Enjoy!